Pumpkin Spice Book Do you remember when Pumpkin Spice Lattes came about? Do you remember who started it all? Did you know that there are Pumpkin Spice Lattes for dogs and Pumpkin Spice Hair Color? Now you have the Pumpkin Spice Book. The Pumpkin Spice Book tells the story of a grandmother that used to live in the thick forest in Germany and would take care of children who were abandoned by their father. Because the new wife didn’t want to compete for his attention. 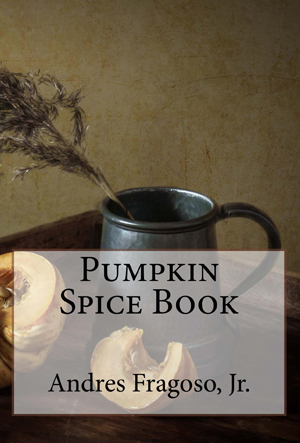 Pumpkin Spice Book has 5 excellent Pumpkin Spice recipes. The lyrics to Pumpkin Spice Song which is performed by the Pumpkin Spice Boys. The Pumpkin Spice Poem and a long list of Pumpkin Spice Products that we pay a substantial premium when we purchase them. Pumpkin Spice is all around us and if you are a fan of the spice of life. You’re going to love the Pumpkin Spice Book.